Early spring farm scene taken somewhere between Davenport and Eldridge while on a drive to Donahue, Iowa. Enter TEAM ARYN in the NOTES SECTION at CHECK OUT, and a donation will be made to TEAM ARYN. If you would like recognition for your donation, please let me know, and I will enter your name in the recognition spot when I donate the money. It’s hot out, but if you can get there early, it’s worth the trip to head out to The Pride of the Wapsi this week to get some, oh so yummy, fresh strawberries! The cool spring temperatures and nice rains we had this spring have made or some lovely, sweet, yet tart, little jewels! This year, is by far, one of the best tasting years for strawberries in a long time, in my opinion. I would recommend getting there as early as possible, wear light colors, hats, and use plenty of sunscreen. A nice jug of cold bottled water is highly recommended for after the pick. Oh, and prepare to end up with random strawberry stains in odd places! You will be given a tray that can hold up to 10 pounds of strawberries. Price is $2/lb. Then, you’ll get a ride out to the field in a golf cart, where you will be given instructions for where you can pick. Hold on tight, it’s a bumpy ride! Afterwards, you’ll get a ride back to the shed where your berries will be weighed, and you can pay. There is a nice, outdoor hand washing station with soap and paper towels, so you can clean up a bit before you leave. On our visit, we saw a resident cow and 3 huge pigs. All in all, it was a fun experience, even for my 2 little boys who were dragging their feet about wanting to go. They were pleasantly surprised. I think they enjoyed the crazy golf cart ride that the young lad gave us out to the strawberry patch! On our visit, we saw a resident cow and 3 huge pigs. All in all, it was a fun experience, even for my 2 little boys who were dragging their feet about wanting to go. They were pleasantly surprised. I think they enjoyed the crazy golf cart ride that the young lad gave us out to the strawberry patch more than the strawberries! Find a pick your own farm near you! Heading out to the garden to pick some radishes, and actually eat them! Finally tried them sliced thin and sautéed in fresh garlic, rosemary, parsley, butter, olive oil, and then seasoned w/kosher salt. They were actually good! And I thought I hated radishes! Even steamed the greens and ate them too. 3. Once garlic is sautéed after about 3 minutes, add the butter and melt. 4. Then add the thinly sliced radishes and sauté until tender, then add about 1/2 teaspoon kosher salt and toss. 5. Add about 2 Tablespoons water to the skillet, and then steam 4-6 cups of baby radish greens, baby kale, and baby spinach for about 1 minute or until barely wilted. This makes a beautiful green edible background for Tuna steaks, or whatever steak you are in the mood for. I had mine last night with pan seared Tuna steaks and a side of Flax and Quinoa pilaf. Yum, and my kids thought I was a rock star chef and devoured it! A collection of lilac florets I meticulously arranged on construction paper one night after my boys went to sleep a few years ago. There is something so soothing to me, to be able to be alone at night, after the house has reached a calm state, and to craft away with items I have collected from our daily outdoor adventures. If you would like to purchase this print and customize it with a monogram or a name, I would be glad to help you!, Just click on the photo above, and it will take you to my etsy shop, Marie Stephens Design. My public service announcement for today is: “Now is the time for all good men and women to come to the aid of their lilacs and trim, shear, thin, and prune them. ” Always prune your lilacs, if they need it, right after they bloom, because if you wait too long after they bloom, you will be removing next years buds. 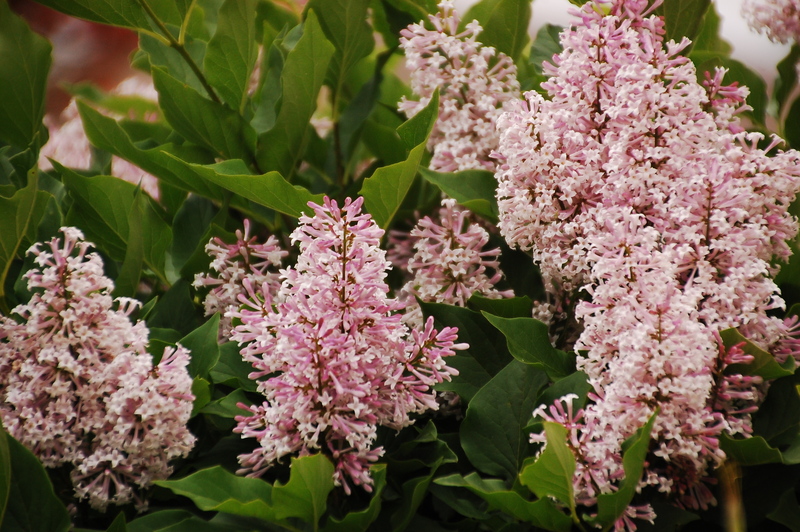 ©Marie Stephens Design 2014 This is a Korean Lilac from my garden in Iowa last spring. “Keep Calm and Fight On” says my nephew, Isaac, who was recently diagnosed with type 1 diabetes last fall. Team Isaac: If you would like to help out Juvenile Diabetes Research Foundation, click on the photo to learn more or join a JDRF Walk in your area. I was able to use the tent I used when I sold flowers at the Des Moines Farmers Market, and the chalkboard painted sign that my husband made for me to use to promote my old flower shop. I even had an open/closed sign to hang on my mailbox. All props that I had from owning a flower business nearly ten years ago. Good thing I never throw anything away! Last week was the Juvenile Diabetes Research foundation walk and fundraiser for the Quad Cities Area. My nephew had his own team, Team Isaac, and my family and I had planned to walk. A few months ago, I registered, donated some money, and thought I was done, but the more I thought about it, the more I wanted to do, well….more! On a whim, I decided to set my fundraising goal to $1000. A few clicks, and entries, and I was set. There was nothing binding me to that goal, and I could have even lowered it, but something in me wanted to rise to the challenge and hit that goal. My next thought was, “Oh crap! What the heck was I thinking?” How am I going to raise a thousand dollars? One week to go before the deadline, and I was only at about 25% of my goal. The weather was set to be perfect conditions for the week: cool, sunny, and dry. The soil was moist, as it had rained quite a bit the weekend before. The stars were aligning, and the timing was perfect for none other than, a plant sale! I titled it, “Marie’s Dig for Diabetes”. I don’t have many things that other people want or really need, but one thing I do have, is a hunormous perennial garden. I also have a love for photography, and have been taking pictures of my perennial flowers for years, so I was able to design a nice little catalog page that showed some of the items I was digging. This is the little catalog page I made in Photoshop to use for promoting my fundraiser on Facebook. 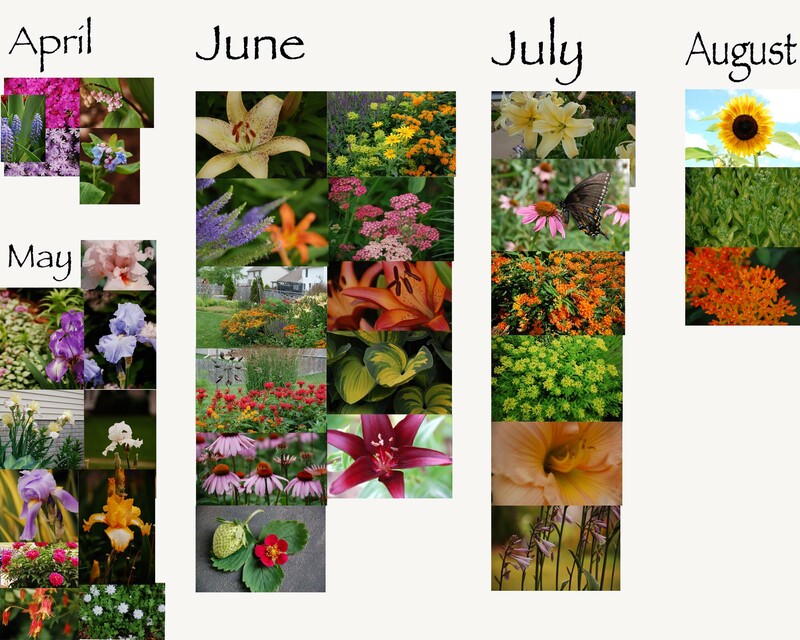 I organized the photos by the month that they bloom. If the same plant appears under more than one month, that means it blooms for each of the months it’s listed under. 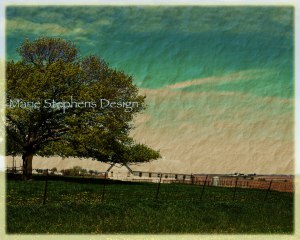 All photos are copyright Marie Stephens, and taken from my garden. 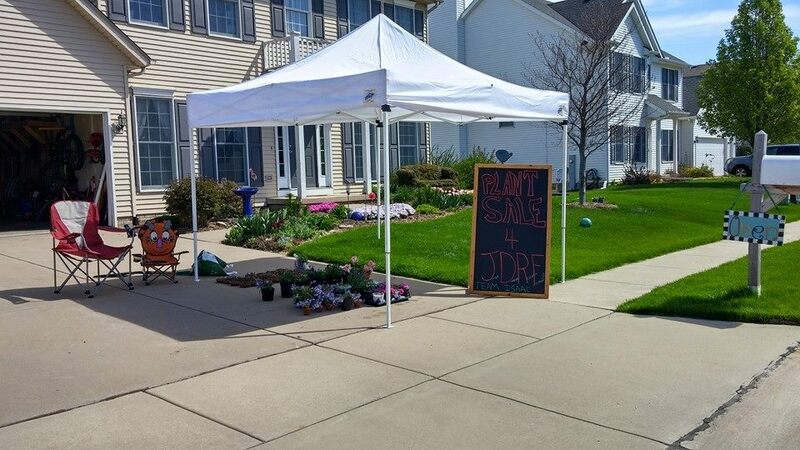 In exchange for donations to Juvenile Diabetes Research Foundation, I would dig up starts of any of the plants shown. I had some starts pre-potted, using old cottage cheese and yogurt containers with holes drilled in the bottom for drainage. I would also divide starts on the spot and place them in grocery bags. With the help of my family, friends and neighbors, and even a few strangers, I was able to sell enough plants to meet my goal, just in the nick of time! Eric and Anna sent me pictures of their north facing home where they wanted to re-do their flower beds. I was able to draw the plants right onto the picture, and then email them a preview of what it could look like once it all grew in. 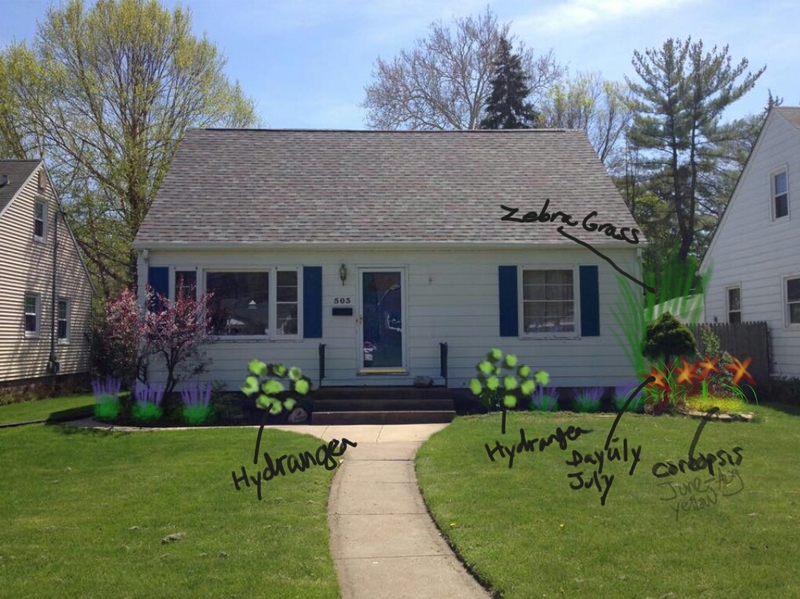 I even did a little bit of landscape design for one couple using my son’s tablet and a paint program app that I have. All in all, it was a great experience, and I hope all the folks who bought plants had fun too. It was fun to socialize and know that my work was going to a great cause. My buns and hips and back were killing me, but a little bit of muscle soreness pales in comparison to all the insulin shots and pokes my nephew has had to endure in just the last 6 months alone. I would do this again in a heart beat. It’s so easy to forget how easy it is to make a difference. I am filled with gratitude to have had the opportunity to be reminded, just how easy it is! If you have a talent, a skill, that you haven’t used in a while, get out there and use it! Who knows how many people you could be helping. And let me just say, it feels so awesome to help, and feel useful for a great cause! Haul it back home and spread it evenly over your yard, about a 1/2 inch thick layer over the lawn. Enjoy all the compliments you’ll be getting over the next few weeks as your neighbors oo and ahhh over how lush your grass looks! This is great to do once a year or every couple of years. Why does it work? It supplements your lawn with much needed organic matter and nutrients. WARNING: You might have to mow a lot more often! If you’d rather not deal with the compost method, milorganite is a natural alternative. Milorganite releases nitrogen slowly to your lawn and ornamentals in a form readily available to plants. There is no need to water it in either! What is Milorganite? Purchase a bag of pelletized milorganite from your local garden center or home center. Put it in your fertilizer spreader, and set it according to the instructions on the bag. It’s a nice slow releasing fertilizer. Apply once in the spring and fall. I am not claiming to be any kind of lawn expert by any means, but I have seen the difference first hand in our own lawn since my husband has begun doing this. My brothers also have used the compost application method, and have had the same success. That’s it for today! Happy gardening, and mowing! Have you broken down yet and got out the mower, or are you at a standoff with your neighbor to see who mows first? Spring is in the air, but there’s still a bit of a chill in it! 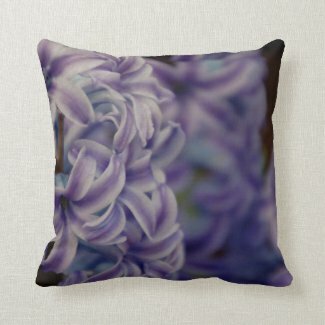 So of course, I’m yearning for flowers and adding them to pillows. The photo below is of a lovely grouping of purple hyacinth flowers that I took a year or two ago on one of my dates with my little son, Ben, to the conservatory at Vander Veer Park. Vander Veer Park Conservatory is one of the best places to visit in February and March, when you are itching to get outside, but it’s still just too cold and windy to be out for long. During these two months, the conservatory is bursting with blooms of all kinds. Among my favorites, are these lovely purple Hyacinths. They only last a week or two, but they make an amazing show and powerful fragrance. Wisk ingredients together and rub all over meat. NOTE: Works best if you wisk dry ingredients together first, then add wet ingredients and wisk again to avoid lumps of spices. Meat: 3 to 4 lbs of Boneless Beef Short Ribs from Fareway or your favorite butcher. Only about $4.99/lb, and tastes delicious, like a flat iron steak but in roast form. This recipe is for 3 to 3.5 lbs of meat. Put meat in a foil lined baking dish, I use a ceramic roasting pan…a deep one. Arrange the ribs side by side, standing on the skinny side, and nestle in the pan as close together as you can. I put the fat side facing up so it can baste the meat as it cooks. After you mixed all the spices and oil and vinegar, rub it evenly all over the meat on all sides. If you want the flavor to go down into the meat, you can pierce the meat on top but don’t go all the way through. then turn down the heat to 325. Cook for half hour, then baste with the juices, then another half hour, baste, then maybe 20 or 30 more minutes until it reaches your desired level of done ness. You can either just use the juice as is for an au jus sauce to dip meat in, or make gravy to go w/ mashed potatoes. then turn down heat a bit and keep stirring until it thickens. I use the Betty Crocker Recipe for my mashed potatoes, and use the gigantic individually sold potatoes, because they are much faster and easier to peel. 4 large potatoes makes enough for our family of 4 and we still have a few leftovers. I usually roast carrots and other veggies in a separate dish, so they don’t get too soggy or too much fat from the beef on them. Usually roast about 10 whole carrots in the oven too. Let me know if you have any other questions. NOTE: If you want the meat super evenly cooked, it’s a little extra work, but you can cook it for 7-10 minutes at 500 and the flip it over and do another 7 minutes or so, but it’s a lot of work and sometimes you burn yourself doing it! It’s kind of hard to do with the beef ribs vs. a whole roast.